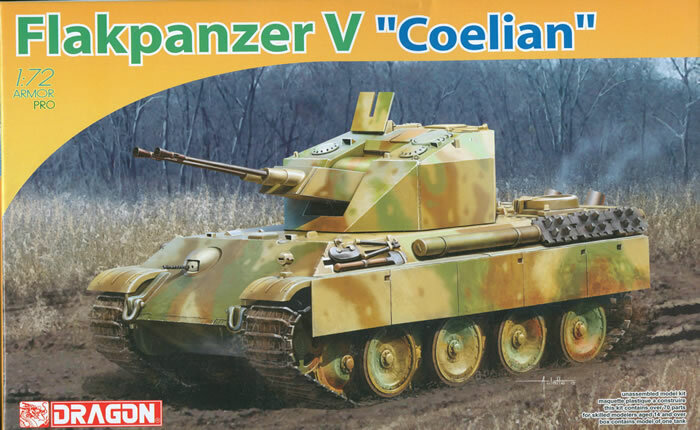 Years ago DML released a 1/35 scale kit of the “Coelian” prototype twin 3.7 cm AA tank based on a Panther Ausf. G chassis. While the actual vehicle never went into production for a number of reasons (mostly delays and a bigger need for gun tanks) it has always been popular with Panther fans as a fairly attractive vehicle. DML has now returned with a 1/72 scale version of this vehicle based on their Ausf. G kits with a totally new turret. The hull consists of three parts - upper, lower and stern plate. The road wheel arms are premolded into the lower hull but in the case of this kit uses totally separate wheels for each axle. The idler wheel consists of two parts and even the small intermediate roller is included. The tracks now come as with all recent DML 1/72 scale kits with an indicator that the tracks are to be 182mm in overall length. These measured out at 183mm but once formed to the right “sag” should appear right on the money. All hatches are molded in place on both the hull and turret with the exception of the engine deck, which comes with the false engine to cover the screw assembly mount in the older mold hull bottom. (The other one goes under the machine gun blister on the glacis, but no screws are provided for assembly.) Anyone wanting to use figures in the hatches has some work on his hands to make changes. The turret makes good use of slide molding to capture details with the drum trapped for elevation. The barrels have hollow flash hiders which is a nice touch in this scale. Technical assistance is not listed but is assumed to be from Tom Cockle and Gary Edmundson. Two finishing options are provided: “Unidentified Unit” Germany 1945 (tricolor with black crosses); Unidentified Unit, 1945 (sand with a primer red turret, black crosses). A tiny sheet of six crosses from Cartograf is provided. Overall Panther fans will be happy to see this vehicle in this scale to join the previous Panther releases.